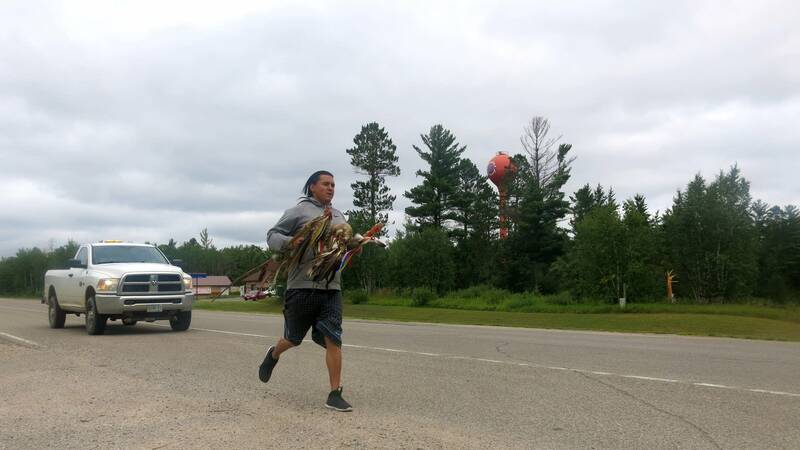 Teena LaPointe ran along the shoulder of Highway 89, about 20 miles south of Red Lake. She carried three ceremonial staves, ornamented with eagle feathers and ribbon, through the spitting rain. Family friend Gary Charwood coasted behind in an old Silverado with its hazard lights blinking. "She's on this run," he said, "because she may have made some choices and now she's aiming to turning her life around." Charwood and LaPointe are both from Leech Lake. 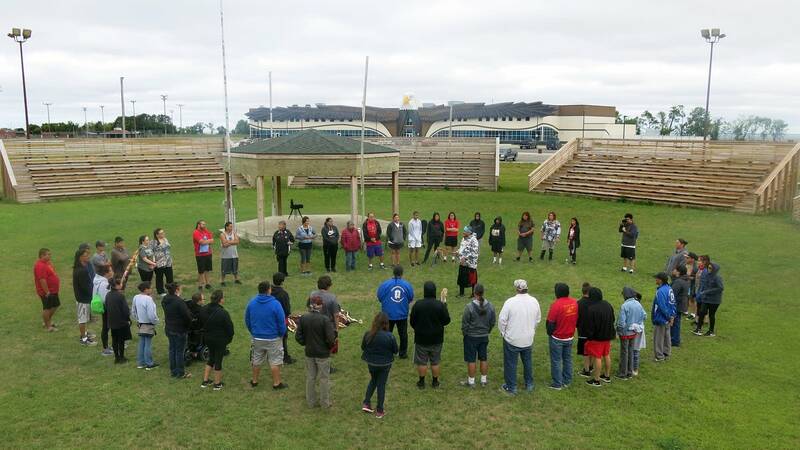 They're part of a group of several dozen runners traveling from the Red Lake Indian Reservation to the powwow grounds on the Fond du Lac reservation. 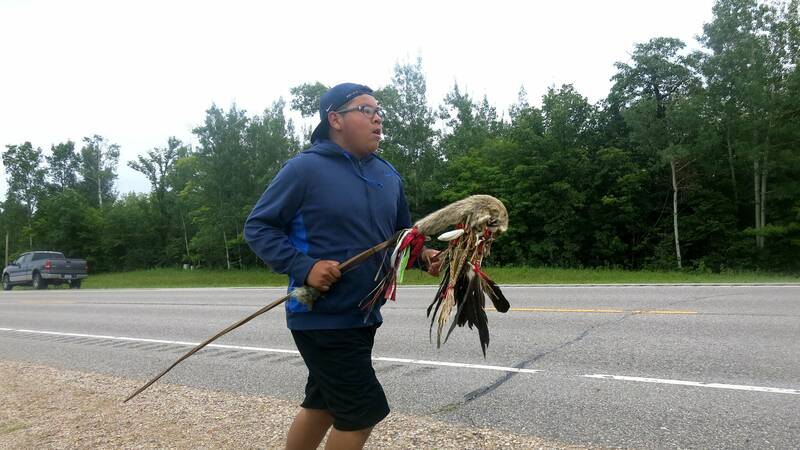 It's called the Anishinaabe Spirit Run, and it's meant to promote sobriety. They left Wednesday and will arrive Saturday afternoon, just in time for the 40th annual sobriety powwow. That's 200 miles in just four days, on foot. Charwood helped organize the run and convinced LaPointe to come along. "She admits, she's out of shape," he said. "But she's determined." LaPointe ran a third of a mile, then handed off the staves to another runner. That's how it works. No one runs the whole 200 miles. She climbed back in the truck to rest before her next turn. Charwood said she "may have made some choices." LaPointe went into more detail. She said she's struggled with addiction for six years. "Methamphetamine was — is — my drug of choice," she said. "My sobriety now, I can say that I'm going on a full week. So my sobriety is very short." She said she hoped overcoming the physical pain of the run would act as a turning point in her life. She hoped it will help her find spiritual footing. And that's really why Charwood wanted her to come. There are a lot of charity races in the summer. It would be easy to lump the Spirit Run in with the rest, but it's very different. Each day starts with a drum circle. 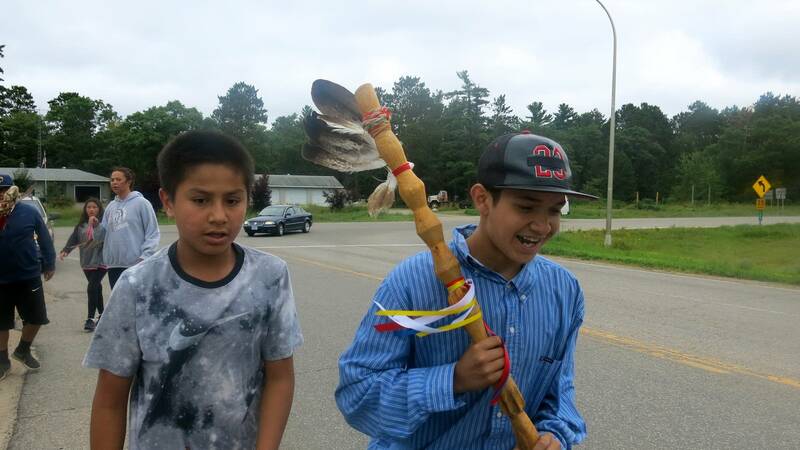 The runners hand out tobacco, burn sage and carry the eagle staves. "There's nothing new to what we're doing," Charwood said. "It's always been a part of who we are." A few miles down the road, Nate Taylor, from Red Lake, waited his turn. He's studied his native culture and spirituality for years, and said running is no less meaningful than a sweat lodge, or a sun dance ceremony. "Life is motion," he said. "The Ojibwe language doesn't have many nouns in it. There's not too many fixed objects. A run represents the same thing. It's a significant prayer." It's a hard concept to nail down in English, Taylor said, but the ceremonial staves, known as eagle staves, give a physical shape to a runner's prayers. This year's Spirit Run is led by three staves. One was made more than 20 years ago when the four-day event first started. It's a long chunk of wood, carved in a spiral pattern. That, Taylor said, is a prayer for sobriety. The second was made by a group in Minneapolis after the Red Lake school shooting in 2005, and carried on foot all the way to the reservation. That's a prayer of grief. And the third one is Taylor's own staff. He made it years ago and helped carry it thousands of miles from Canada to South America. "A lot of people I know and even people who have passed on have ran with that staff," he said. "It means a lot to my family." He caught the staves from an exhausted teenager and headed off down the road, a third of a mile at a time. The runners are scheduled to leave Grand Rapids Friday and will end their run Saturday, at Sawyer on the Fond du Lac reservation. They'll get there for the 40th annual sobriety powwow at the Mash-ka-wisen treatment center. MPR News' Evan Frost will be there, helping participants take self-portraits and recording stories of recovery.